A computer information system is a system composed of people and computers that processes or interprets information. The term is also sometimes used in more restricted senses to refer to only the software used to run a computerized database or to refer to only a computer system. Information Systems is an academic study of systems with a specific reference to information and the complementary networks of hardware and software that people and organizations use to collect, filter, process, create and also distribute data. An emphasis is placed on an information system having a definitive boundary, users, processors, storage, inputs, outputs and the aforementioned communication networks. Any specific information system aims to support operations, management and decision-making. An information system is the information and communication technology (ICT) that an organization uses, and also the way in which people interact with this technology in support of business processes. Silver et al. (1995) provided two views on IS that includes software, hardware, data, people, and procedures. Zheng provided another system view of information system which also adds processes and essential system elements like environment, boundary, purpose, and interactions. The Association for Computing Machinery defines "Information systems specialists [as] focus[ing] on integrating information technology solutions and business processes to meet the information needs of businesses and other enterprises." There are various types of information systems, for example: transaction processing systems, decision support systems, knowledge management systems, learning management systems, database management systems, and office information systems. Critical to most information systems are information technologies, which are typically designed to enable humans to perform tasks for which the human brain is not well suited, such as: handling large amounts of information, performing complex calculations, and controlling many simultaneous processes. Information technologies are a very important and malleable resource available to executives. Many companies have created a position of chief information officer (CIO) that sits on the executive board with the chief executive officer (CEO), chief financial officer (CFO), chief operating officer (COO), and chief technical officer (CTO). The CTO may also serve as CIO, and vice versa. The chief information security officer (CISO) focuses on information security management. Hardware: The term hardware refers to machinery. This category includes the computer itself, which is often referred to as the central processing unit (CPU), and all of its support equipment. Among the support, equipment are input and output devices, storage devices and communications devices. Software: The term software refers to computer programs and the manuals (if any) that support them. Computer programs are machine-readable instructions that direct the circuitry within the hardware parts of the system to function in ways that produce useful information from data. Programs are generally stored on some input/output medium, often a disk or tape. Data: Data are facts that are used by programs to produce useful information. Like programs, data are generally stored in machine-readable form on disk or tape until the computer needs them. Procedures: Procedures are the policies that govern the operation of a computer system. "Procedures are to people what software is to hardware" is a common analogy that is used to illustrate the role of procedures in a system. Feedback: it is another component of the IS, that defines that an IS may be provided with a feedback (Although this component isn't necessary to function). Data is the bridge between hardware and people. This means that the data we collect is only data until we involve people. At that point, data is now information. 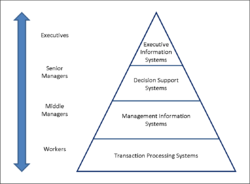 The "classic" view of Information systems found in the textbooks in the 1980s was a pyramid of systems that reflected the hierarchy of the organization, usually transaction processing systems at the bottom of the pyramid, followed by management information systems, decision support systems, and ending with executive information systems at the top. Although the pyramid model remains useful since it was first formulated, a number of new technologies have been developed and new categories of information systems have emerged, some of which no longer fit easily into the original pyramid model. Hardware- these are the devices like the monitor, processor, printer and keyboard, all of which work together to accept, process, show data and information. Software- are the programs that allow the hardware to process the data. Databases- are the gathering of associated files or tables containing related data. Networks- are a connecting system that allows diverse computers to distribute resources. Procedures- are the commands for combining the components above to process information and produce the preferred output. The first four components (hardware, software, database, and network) make up what is known as the information technology platform. Information technology workers could then use these components to create information systems that watch over safety measures, risk and the management of data. These actions are known as information technology services. Certain information systems support parts of organizations, others support entire organizations, and still others, support groups of organizations. Recall that each department or functional area within an organization has its own collection of application programs or information systems. These functional area information systems (FAIS) are supporting pillars for more general IS namely, business intelligence systems and dashboards. As the name suggests, each FAIS support a particular function within the organization, e.g. : accounting IS, finance IS, production-operation management (POM) IS, marketing IS, and human resources IS. In finance and accounting, managers use IT systems to forecast revenues and business activity, to determine the best sources and uses of funds, and to perform audits to ensure that the organization is fundamentally sound and that all financial reports and documents are accurate. Other types of organizational information systems are FAIS, Transaction processing systems, enterprise resource planning, office automation system, management information system, decision support system, expert system, executive dashboard, supply chain management system, and electronic commerce system. Dashboards are a special form of IS that support all managers of the organization. They provide rapid access to timely information and direct access to structured information in the form of reports. Expert systems attempt to duplicate the work of human experts by applying reasoning capabilities, knowledge, and expertise within a specific domain. Information technology departments in larger organizations tend to strongly influence the development, use, and application of information technology in the business. A series of methodologies and processes can be used to develop and use an information system. Many developers use a systems engineering approach such as the system development life cycle (SDLC), to systematically develop an information system in stages. The stages of the system development lifecycle are planning, system analysis and requirements, system design, development, integration and testing, implementation and operations and maintenance. Recent research aims at enabling and measuring the ongoing, collective development of such systems within an organization by the entirety of human actors themselves. An information system can be developed in house (within the organization) or outsourced. This can be accomplished by outsourcing certain components or the entire system. A specific case is the geographical distribution of the development team (offshoring, global information system). as well as for drawing conclusions from such expressions. The field of study called information systems encompasses a variety of topics including systems analysis and design, computer networking, information security, database management and decision support systems. Information management deals with the practical and theoretical problems of collecting and analyzing information in a business function area including business productivity tools, applications programming and implementation, electronic commerce, digital media production, data mining, and decision support. Communications and networking deals with the telecommunication technologies. Information systems bridges business and computer science using the theoretical foundations of information and computation to study various business models and related algorithmic processes  on building the IT systems  within a computer science discipline. Computer information system(s) (CIS) is a field studying computers and algorithmic processes, including their principles, their software and hardware designs, their applications, and their impact on society, whereas IS emphasizes functionality over design. Several IS scholars have debated the nature and foundations of Information Systems which have its roots in other reference disciplines such as Computer Science, Engineering, Mathematics, Management Science, Cybernetics, and others. Information systems also can be defined as a collection of hardware, software, data, people and procedures that work together to produce quality information. Similar to computer science, other disciplines can be seen as both related and foundation disciplines of IS. The domain of study of IS involves the study of theories and practices related to the social and technological phenomena, which determine the development, use, and effects of information systems in organization and society. But, while there may be considerable overlap of the disciplines at the boundaries, the disciplines are still differentiated by the focus, purpose, and orientation of their activities. In a broad scope, the term Information Systems is a scientific field of study that addresses the range of strategic, managerial, and operational activities involved in the gathering, processing, storing, distributing, and use of information and its associated technologies in society and organizations. The term information systems is also used to describe an organizational function that applies IS knowledge in industry, government agencies, and not-for-profit organizations. Information Systems often refers to the interaction between algorithmic processes and technology. This interaction can occur within or across organizational boundaries. An information system is the technology an organization uses and also the way in which the organizations interact with the technology and the way in which the technology works with the organization’s business processes. Information systems are distinct from information technology (IT) in that an information system has an information technology component that interacts with the processes' components. One problem with that approach is that it prevents the IS field from being interested in non-organizational use of ICT, such as in social networking, computer gaming, mobile personal usage, etc. A different way of differentiating the IS field from its neighbours is to ask, "Which aspects of reality are most meaningful in the IS field and other fields?" This approach, based on philosophy, helps to define not just the focus, purpose and orientation, but also the dignity, destiny and, responsibility of the field among other fields. International Journal of Information Management, 30, 13-20. There is a wide variety of career paths in the information systems discipline. "Workers with specialized technical knowledge and strong communications skills will have the best prospects. Workers with management skills and an understanding of business practices and principles will have excellent opportunities, as companies are increasingly looking to technology to drive their revenue." Information technology is important to the operation of contemporary businesses, it offers many employment opportunities. The information systems field includes the people in organizations who design and build information systems, the people who use those systems, and the people responsible for managing those systems. The demand for traditional IT staff such as programmers, business analysts, systems analysts, and designer is significant. Many well-paid jobs exist in areas of Information technology. At the top of the list is the chief information officer (CIO). The CIO is the executive who is in charge of the IS function. In most organizations, the CIO works with the chief executive officer (CEO), the chief financial officer (CFO), and other senior executives. Therefore, he or she actively participates in the organization's strategic planning process. Information systems research is generally interdisciplinary concerned with the study of the effects of information systems on the behaviour of individuals, groups, and organizations. Hevner et al. (2004) categorized research in IS into two scientific paradigms including behavioural science which is to develop and verify theories that explain or predict human or organizational behavior and design science which extends the boundaries of human and organizational capabilities by creating new and innovative artifacts. Constructs which are concepts that form the vocabulary of a domain. They constitute a conceptualization used to describe problems within the domain and to specify their solutions. A model which is a set of propositions or statements expressing relationships among constructs. A method which is a set of steps (an algorithm or guideline) used to perform a task. Methods are based on a set of underlying constructs and a representation (model) of the solution space. An instantiation is the realization of an artifact in its environment. Build an artifact to perform a specific task. Evaluate the artifact to determine if any progress has been achieved. Given an artifact whose performance has been evaluated, it is important to determine why and how the artifact worked or did not work within its environment. Therefore, theorize and justify theories about IT artifacts. Although Information Systems as a discipline has been evolving for over 30 years now, the core focus or identity of IS research is still subject to debate among scholars. There are two main views around this debate: a narrow view focusing on the IT artifact as the core subject matter of IS research, and a broad view that focuses on the interplay between social and technical aspects of IT that is embedded into a dynamic evolving context. A third view calls on IS scholars to pay balanced attention to both the IT artifact and its context. Since the study of information systems is an applied field, industry practitioners expect information systems research to generate findings that are immediately applicable in practice. This is not always the case however, as information systems researchers often explore behavioral issues in much more depth than practitioners would expect them to do. This may render information systems research results difficult to understand, and has led to criticism. In the last ten years, the business trend is represented by the considerable increasing of Information Systems Function (ISF) role, especially with regard the enterprise strategies and operations supporting. It became a key-factor to increase productivity and to support new value creation. To study an information system itself, rather than its effects, information systems models are used, such as EATPUT. The international body of Information Systems researchers, the Association for Information Systems (AIS), and its Senior Scholars Forum Subcommittee on Journals (23 April 2007), proposed a 'basket' of journals that the AIS deems as 'excellent', and nominated: Management Information Systems Quarterly (MISQ), Information Systems Research (ISR), Journal of the Association for Information Systems (JAIS), Journal of Management Information Systems (JMIS), European Journal of Information Systems (EJIS), and Information Systems Journal (ISJ). A number of annual information systems conferences are run in various parts of the world, the majority of which are peer reviewed. The AIS directly runs the International Conference on Information Systems (ICIS) and the Americas Conference on Information Systems (AMCIS), while AIS affiliated conferences include the Pacific Asia Conference on Information Systems (PACIS), European Conference on Information Systems (ECIS), the Mediterranean Conference on Information Systems (MCIS), the International Conference on Information Resources Management (Conf-IRM) and the Wuhan International Conference on E-Business (WHICEB). AIS chapter conferences include Australasian Conference on Information Systems (ACIS), Information Systems Research Conference in Scandinavia (IRIS), Information Systems International Conference (ISICO), Conference of the Italian Chapter of AIS (itAIS), Annual Mid-Western AIS Conference (MWAIS) and Annual Conference of the Southern AIS (SAIS). EDSIG, which is the special interest group on education of the AITP, organizes the Conference on Information Systems and Computing Education and the Conference on Information Systems Applied Research which are both held annually in November. ^ Piccoli, Gabriele; Pigni, Federico (July 2018). Information systems for managers: with cases (Edition 4.0 ed.). Prospect Press. p. 28. ISBN 978-1-943153-50-3. Retrieved 25 November 2018. ^ O’Hara, Margaret; Watson, Richard; Cavan, Bruce (1999). "Managing the three levels of change". Information Systems Management. 16 (3): 64. doi:10.1201/1078/43197.16.3.19990601/31317.9. Retrieved 25 November 2018. ^ "Information Systems". Principia Cybernetica Web. ^ Vladimir Zwass (2016-02-10). "Information system". Britannica.com. ^ Bulgacs, Simon (2013). "The first phase of creating a standardised international technological implementation framework/software application". Int. J. Business and Systems Research. 7 (3): 250. doi:10.1504/IJBSR.2013.055312. Retrieved 2015-11-02. ^ Alter, S (2013). "Work System Theory: Overview of Core Concepts, Extensions, and Challenges for the Future". Journal of the Association for Information Systems. 14 (2): 72–121. doi:10.17705/1jais.00323. ^ Rockart et al. (1996) Eight imperatives for the new IT organization Sloan Management review. ^ Laudon, K.C. and Laudon, J.P. Management Information Systems, (2nd edition), Macmillan, 1988. ^ Rainer, R. Kelly Jr and Casey G. Cegielski. Introduction to Information System: Support and Transforming Business Fourth Edition. New Jersey: John Wiley and Sons, Inc., 2012. Print. ^ Neumann, Gustaf; Sobernig, Stefan; Aram, Michael (February 2014). "Evolutionary Business Information Systems". Business and Information Systems Engineering. 6 (1): 33–36. doi:10.1007/s12599-013-0305-1. ^ Using MIS. Kroenke. 2009. ISBN 978-0-13-713029-0. ^ Börje Langefors (1973). Theoretical Analysis of Information Systems. Auerbach. ISBN 978-0-87769-151-8. ^ Computer Studies. Frederick Nyawaya. 2008. ISBN 978-9966-781-24-6. ^ "Computer and Logic Essentials - Units of study - Swinburne University of Technology - Melbourne, Australia". ^ "Building IT Systems - RMIT University". ^ "Systems Development - Units of study - Swinburne University of Technology - Melbourne, Australia". ^ Denning, Peter (June 2007). "Ubiquity a new interview with Peter Denning on the great principles of computing". 2007 (June): 1. People from other fields are saying they have discovered information processes in their deepest structures and that collaboration with computing is essential to them. ^ Culnan, M. J. Mapping the Intellectual Structure of MIS, 1980-1985: A Co-Citation Analysis, MIS Quarterly, 1987, pp. 341-353. ^ Keen, P. G. W. MIS Research: Reference Disciplines and A Cumulative Tradition, in Proceedings of the First International Conference on Information Systems, E. McLean (ed. ), Philadelphia, PA, 1980, pp. 9-18. ^ Lee, A. S. Architecture as A Reference Discipline for MIS, in Information Systems Research: Contemporary Approaches and Emergent Traditions, H.-E. Nisen, H. K. Klein, and R. A. Hirschheim (eds. ), North-Holland, Amsterdam, 1991, pp. 573-592. ^ Mingers, J., and Stowell, F. (eds.). Information Systems: An Emerging Discipline?, McGraw- Hill, London, 1997. ^ a b c "Scoping the Discipline of Information Systems" (PDF). ^ Basden, A. (2010) On Using Spheres of Meaning to Define and Dignify the IS Discipline. International Journal of Information Management, 30, 13-20. It employs the philosophy of the late Herman Dooyeweerd to differentiate distinct aspects or 'spheres of meaning'. The paper suggests that while computer science finds the formative aspect, of shaping, structuring, processing, of central interest, and business and organizational fields find the economic and social aspects of central interest, the Information Systems field can find the lingual aspect of central interest, while making links with the aspects of the neighbouring disciplines. ^ "Information Systems". Sloan Career Cornerstone Center; Alfred P. Sloan Foundation. 2008. Retrieved June 2, 2008. ^ Galliers, R.D., Markus, M.L., & Newell, S. (Eds) (2006). Exploring Information Systems Research Approaches. New York, NY: Routledge. ^ Hevner; March; Park; Ram (2004). "Design Science in Information Systems Research". MIS Quarterly. 28 (1): 75–105. doi:10.2307/25148625. JSTOR 25148625. ^ March, S.; Smith, G. (1995). "Design and natural science in Information Technology (IT)". Decision Support Systems. 15 (4): 251–266. doi:10.1016/0167-9236(94)00041-2. ^ Avgerou, C (2000). "Information systems: what sort of science is it?". Omega. 28 (5): 567–579. CiteSeerX 10.1.1.203.4718. doi:10.1016/s0305-0483(99)00072-9. ^ Benbasat, I.; Zmud, R. (2003). "The identity crisis within the IS discipline: defining and communicating the discipline's core properties". MIS Quarterly. 27 (2): 183–194. doi:10.2307/30036527. JSTOR 30036527. ^ Agarwal, R.; Lucas, H. (2005). "The information systems identity crisis: focusing on high- visibility and high-impact research". MIS Quarterly. 29 (3): 381–398. doi:10.2307/25148689. JSTOR 25148689. ^ El Sawy, O (2003). "The IS core –IX: The 3 faces of IS identity: connection, immersion, and fusion". Communications of the AIS. 12: 588–598. ^ Mansour, O., Ghazawneh, A. (2009) Research in Information Systems: Implications of the constant changing nature of IT capabilities in the social computing era, in Molka-Danielsen, J. (Ed. ): Proceedings of the 32nd Information Systems Research Seminar in Scandinavia, IRIS 32, Inclusive Design, Molde University College, Molde, Norway, August 9–12, 2009. ISBN 978-82-7962-120-1. ^ Orlikowski, W.; Iacono, C. (2001). "Research commentary: desperately seeking the "IT" in IT research—a call to theorizing about the IT artifact". Information Systems Research. 12 (2): 121–134. doi:10.1287/isre.12.2.121.9700. ^ Kock, N.; Gray, P.; Hoving, R.; Klein, H.; Myers, M.; Rockart, J. (2002). "Information Systems Research Relevance Revisited: Subtle Accomplishment, Unfulfilled Promise, or Serial Hypocrisy?". Communications of the Association for Information Systems. 8 (23): 330–346. doi:10.17705/1CAIS.00823. ^ Senior Scholars (2007). "AIS Senior Scholars Forum Subcommittee on Journals: A basket of six (or eight) A* journals in Information Systems" (PDF). Archived from the original (PDF) on October 3, 2007. ^ "AIS chapter conferences". affiniscape.com. ^ "EDSIG Information Systems Educators". ^ "Association of Information Technology Professionals". ^ EDSIG, ISCAP and. "ISCAP Conferences - EDSIGCON & CONISAR". Sage, S.M. "Information Systems: A brief look into history", Datamation, 63-69, Nov. 1968. - Overview of the early history of IS. Wikimedia Commons has media related to Information systems. This page was last edited on 15 April 2019, at 03:13 (UTC).